A quick synopsis of recent advancements. There are two milestones that need to materialize for the project to become a reality: (1) Obtaining enough financing to fund the construction of our home and (2) Submitting construction documents to the City to receive the necessary building permits. I am happy to report that we are financed. We have a home equity line of credit which should allow us to fund a significant portion of the build. As previously mentioned, we have owned our home since 2009 and in those 8 years the value of our property has risen significantly, making this project possible. In parallel to pursing funding options we are pushing to get construction documents into the City for permitting. We are almost there! I will update you and share those drawing on the blog when they are submitted. 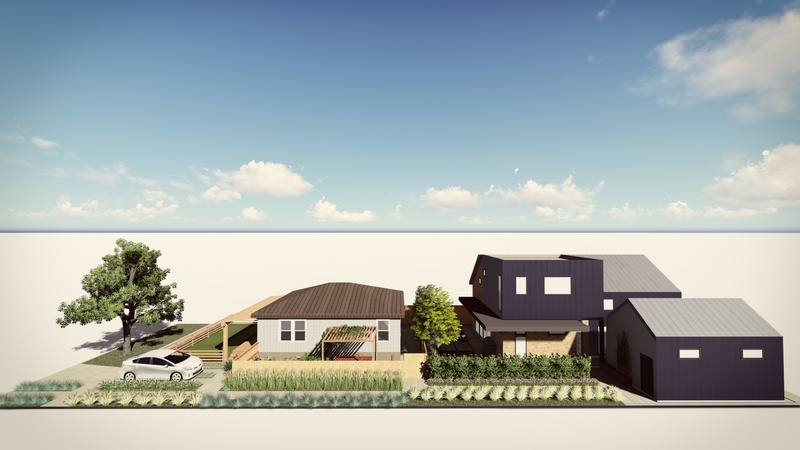 In the meantime I wanted to share a teaser…Below is a recent 3D rendering showing 3634 Wyandot (our current home) at street-front, and the new proposed tandem house, 3632 Wyandot, in the back.